Our Organization was established in November 2013, under the name of KIC-Europe as the first Research & Innovation Centre in Brussels to collect and distribute relevant information and to build up networks in research and innovation between Korea and the EU. 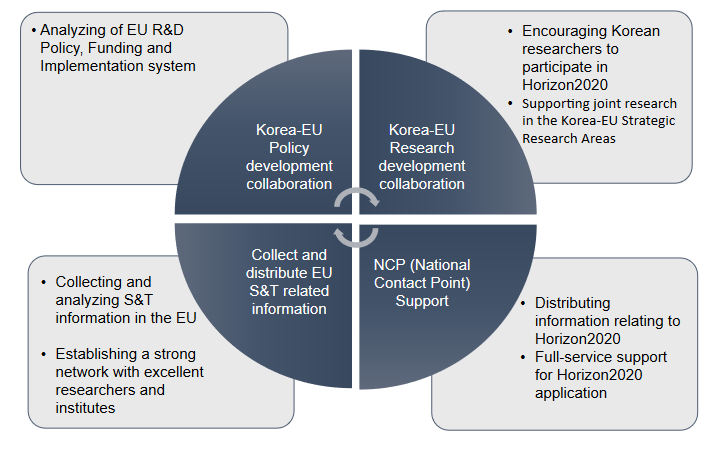 Due to the functions restructure in March 2017, our organization changed its name from KIC-Europe to KERC (Korea-EU Research Center) to focus on R&D collaboration and Policy development between Korea and the EU. Environment) IoT/ICT Belgium ERTICO EU: ERTICO, Bosch, CEA, BMW, Peugeot, Continental, IBM Vedecom, TNO, VTT, NEC, Huawei etc. KERC launched KERC Mentors on 1st November 2017. KERC Mentors, groups of specialist in their own field, promote R&D cooperation between Korea and the EU by providing EU technology trends. KERC Mentors consist of Korean researchers who have a successful career in Europe. They provide European R&D detailed trend analysis for each field.